The Heads of the nuclear regulatory bodies of European nations with nuclear power plants met in Helsinki on the 22 and 23 March 2011. During the meeting WENRA discussed the tragic events in Japan, and in particular the role of nuclear safety regulators in understanding the circumstances. WENRA wishes to express its utmost sympathy for the plight of the Japanese people, its admiration of the dedication of those personnel in responding to the event on the site, and its desire to offer what ever help it could to assist in the response and learning from the event. At the present time -the event is still in progress and much difficult work is required to bring the plant under full control. Furthermore, continued vigilance will be required for weeks if not months to come and the management of the consequences may take decades. 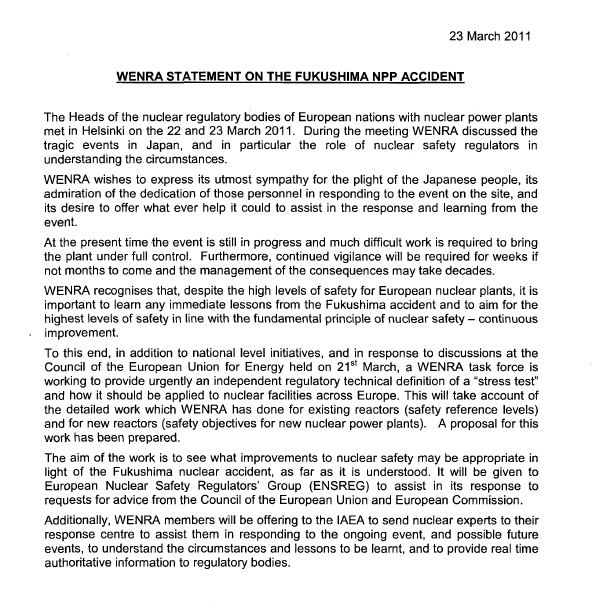 WENRA recognises that, despite the high levels of safety for European nuclear plants, it is important to learn any immediate lessons from the Fukushima accident and to aim for the highest levels of safety in line with the fundamental principle of nuclear safety – continuous improvement. and for new reactors (safety objectives for new nuclear power plants). A proposal for this work has been prepared. The aim of the work is to see what improvements to nuclear safety may be appropriate in light of the Fukushima nuclear accident, as far as it is understood. It will be given to European Nuclear Safety Regulators’ Group (ENSREG) to assist in its response to requests for advice from the Council of the European Union and European Commission. Additionally, WENRA members will be offering to the IAEA to send nuclear experts to their response centre to assist them in responding to the ongoing event, and possible future events, to understand the circumstances and lessons to be learnt, and to provide real time authoritative information to regulatory bodies.